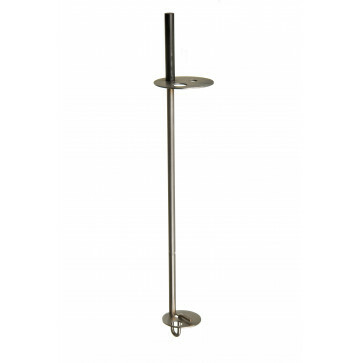 Ubbelohde Viscometer Holder for Ubbelohde Viscometer size 0 to 4. Suitable for use with PSL Rheotek ASTM Ubbelohde Viscometer tubes. Fits a standard 50mm aperture in the viscometer bath lid. Easy to use featuring spring loaded bottom clamp. To change the viscometer tube, simply press lightly on the bottom fitting. This releases the tube and allows for the old tube to be removed and the new tube to be inserted. Spring loaded metal Viscometer Holder, suitable for suspending Ubbelohde Viscometer size 0 to 4 in constant temperature viscometer bath.